The Certified Blockchain Associate is an enterprise employee who has a basic understanding of distributed ledger technology and a general sense of how it affects business operations. The Certified Blockchain Specialist is an enterprise employee who has a fundamental understanding of distributed ledger technology and how it can affect operations within the business unit. The Certified Blockchain Professional is an enterprise professional who has a thorough understanding of distributed ledger technology and how enterprises and organizations can leverage blockchain across corporate silos to drive business objectives. comprehensive understanding of distributed ledger technology, its impact on future operations across organizational units, and how to implement projects and initiatives to meet business objectives. designed and deployed to assist in fulfilling organizational business objectives. designed and deployed across corporate silos to drive business objectives. The Certified Ethereum Specialist is an enterprise employee who has a fundamental understanding of Ethereum blockchain and transactions, and how the platform canaffect operations within the business unit. The Certified Solidity Specialist is an enterprise employee who has a fundamental understanding of the Solidity programming language, and how smart contracts on the Ethereum Virtual Machine can affect operations within the business unit. The Certified Solidity Professional is an enterprise professional who has a thorough understanding of the Solidity programming language, and how smart contracts on the Ethereum Virtual Machine can be designed and deployed across corporate silos to drive business objectives. The Certified Hyperledger Specialist is an enterprise employee who has a fundamental understanding of the open-source Hyperledger programming language, and how distributed ledger applications can affect operations within the business unit. silos to drive business objectives. 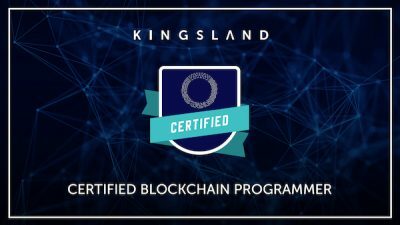 A Certified Blockchain Programmer has a fundamental understanding of distributed ledger technology and can develop various applications using multiple blockchain technologies. A Certified Blockchain Engineer has a deep understanding of distributed ledger technology and can design and implement a blockchain and smart contracts and distributed applications using multiple blockchain technologies. A Certified Blockchain Architect has demonstrated architectural expertise in the increasingly complex blockchain infrastructures of global organizations and understands how to support business strategies with distributed ledger technologies. A Certified Blockchain Expert is a skilled professional with a deep and comprehensive understanding of distributed ledger technology and can build a variety of blockchain infrastructures and applications. A Certified Solidity Programmer has a fundamental understanding of the Solidity programming language and can use the language to build multiple smart contracts on the Ethereum Virtual Machine. A Certified Solidity Engineer has a deep understanding of the Solidity programming language and can design and implement smart contracts on the Ethereum Virtual Machine. A Certified Solidity Architect has demonstrated architectural expertise in the increasingly complex blockchain infrastructures of global organizations and understands how to support business strategies with smart contracts on the Ethereum Virtual Machine. A Certified Solidity Developer is a skilled professional who has an exhaustive understanding of Solidity and can use the language to build multiple distributed ledger applications, including smart contracts for voting, crowdfunding, blind auctions, multi-signature wallets and more, on the Ethereum Virtual Machine. A Certified Smart Contracts Engineer has a deep understanding of smart contracts and the Solidity programming language and can design and implement smart contract types on various blockchain platforms. A Certified Smart Contracts Architect has demonstrated architectural expertise in the increasingly complex blockchain infrastructures of global organizations and understands how to support business strategies with smart contracts created in Solidity on various blockchain platforms. A Certified Smart Contracts Expert has a has a deep and comprehensive understanding of the Solidity programming language and general smart contract protocol, and can develop smart contracts on various blockchain platforms. The Certified Ethereum Expert has a comprehensive and deep understanding of the Ethereum blockchain and transactions and can build a variety of Ethereum infrastructures and applications. A Certified Hyperledger Programmer has a fundamental understanding of the open-source Hyperledger programming language and can use the language to build a variety of applications on different blockchain platforms. A Certified Hyperledger Engineer has a deep understanding of the Hyperledger open-source programming language and can use the language to design and implement a variety of applications on different blockchain platforms. A Certified Hyperledger Architect has demonstrated architectural expertise in the increasingly complex blockchain infrastructures of global organizations and understands how to support business strategies with applications built in the open-source Hyperledger programming language on different blockchain platforms. A Certified Hyperledger Expert has a deep and comprehensive understanding of the open-source Hyperledger programming language and protocol and can develop various applications on different blockchain platforms for cross-industry enterprise use. A Certified Hyperledger Developer is a skilled professional who has an exhaustive understanding of open-source Hyperledger programming language and can use the language to build multiple distributed ledger applications on different blockchain platforms for cross-industry enterprise use. A Certified Solidity Expert has a deep and comprehensive understanding of the Solidity programming language and can develop smart contracts on the Ethereum Virtual Machine.